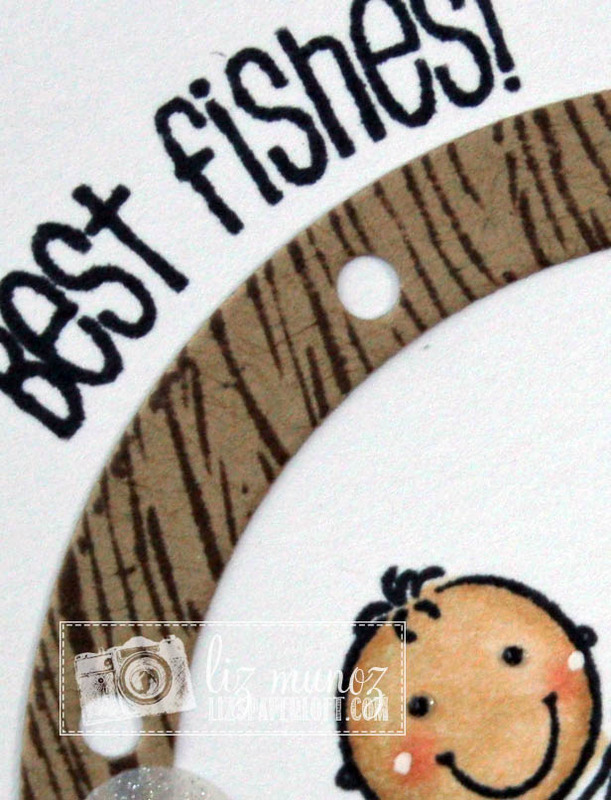 Liz's Paper Loft: MCT July Release Sneak Peek Day 3 ~ best fishes! Whoop Whoop, it's day 3 of My Creative Time's July Release Sneak Peeks! Today I have a BIG surprise for you, well not really me, but Miss Emma! She has her biggest "freebie" stamp and die set to date. Just like always there are some stipulations in order to receive the set free, that will be outlined later this week. These two sets are just ADORABLE! Doesn't his sweet face make you smile! Love this so super cute and simple! OMG Awww OMG TOOOO CUTE!! Miss Liz your card is adorable love your little port hole scene gosh you always come up with such clever and creative ideas. Your fishes are so cute flippin' and a floppin' everywhere made me LOL. I so can't wait to get these goodies. What a week it is!! Adorable card, love the coloring. The window is perfect for framing your little scene, LOVE IT! It's great (maybe not for my wallet :) ) that you showed other products from Miss Emma that go so well with her new sets! Thanks...cute card! Cute, cute, Cute. This stamp set is amazing and love what you did with it. love that u put him in the porthole!!! so adorable!!! These sets are so adorable and so is your card. I really like the design with the port hole and the fish on the outside jumping! Great bubbles too! Simply adorable!! Love this card. Best fishes to you - too. Love how the little fish are popped off the card. Look like they are really jumping out of the water. Such a fun and whimsical card. Love how you created the port hole with the circle die. You did a wonderful job on this card, such great creativity. So cute. I love this little guy. 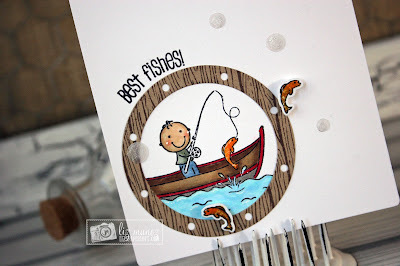 This is a reel-ly cute card. I like how you have the fish outside the circle of attention, too. This is so cute! Love the card! Stunning card that makes you study it closer to realize it's a porthole point of view. This card is super adorable! I love this entire set. Friday seems so long to wait! Love the portal around the picture! I think it's AWESOME! Really makes you feel like your out to sea. Great use of the little fish jumping around outside the portal too! Love your colouring. Great card! That port hole is just perfect with this set! Cute! Cute! Love the porthole. I have that set. Totally adorable!!!! Great design Liz! So cute! 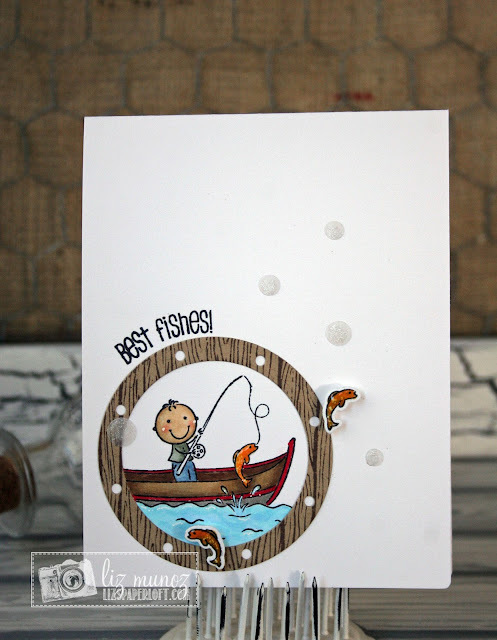 Love your card design and the enamel dots are awesome! Oh this is too CUTE too Liz! Of course the coloring is superb but the die you used to put the image in! EEK! Then to have the 2 other fishes outside ~ LOVE it!